Sterling silver ring, provided with a letter of your choice. Extra nice; Choose multiple rings and form a word or name. Perfect is its simplicity, but even more fun in combination! ♥ The ring is made of sterling silver. 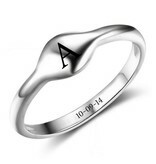 ♥ Place for an inside engraving of up to 20 characters. ♥ Form a word or name of your choice, by combining the rings. ♥ Packed in a luxury jewelry box just ready to give a gift. ♥ Per ornament, Kaya donates an amount of Gambia so that children can go to school.